Description: No school for two whole weeks leaves Tom with heaps of time for the important things in life. Yeah! He can forget all about lessons and the irritating Marcus Meldrew, and save his energy for good stuff! Stuff like: inventing new ways to annoy his sister Delia. (So many). Band practice for the Dogzombies – rock stars in the making! Watching TV and eating caramel wafers; eating caramel wafers and watching TV. Excellent! But clouds are gathering on the horizon in the form of Tom’s weirdo big sister Delia. 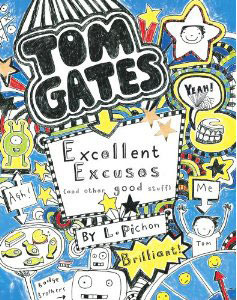 And when trouble collides with his brilliant plans, he’ll need all his excellent excuses... Crammed with scribbles, doodles, stories and sniggers, this hysterical journal brings you more manic mayhem from the crazy world of Tom Gates. HA HA HA! Jake's Review: The first thing I liked is that Tom is sort of like me. He has an annoying teacher, a worst enemy (who is dumb), a best friend and sort of a band. All of the people in his life are just like mine. Delia (who is annoying like my little brother) a Mom (who is too affectionate and kissed me in front of my friends) Even though I think British kids will like it a little bit better, as some of the language is odd British words, Canadian kids will still enjoy. This book would be better for boys than for girls and especially boys my age (11). It's a really funny book that is fast and easy to read as well. I also think it would be good for boys who don't like to read as there are lots of pictures. Mom's Review: Tom Gates books are absolutely delightful and perfect for the reluctant reader. The relationships between Tom and his friends and family are authentic and fun. Tom is just one of those kids you cannot help but love (and in my case totally understand -- cough cough Jake cough cough) My only real complaint is that I think the glossary should be at the beginning for those not used to British Terminology. Jake didn't really have much of a problem as he has heard much of the terminology from his British grandparents, but it may affect kids enjoyment. Kids who are fans of Wimpy Kid, Dumb Diary and Big Nate books will flock to this title.